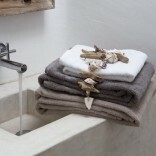 Our soft and super absorbent bath mats will keep your feet warm and bathroom dry. Made from 100% Egyptian cotton 900 GSM, they are fluffy without compromising durability. Perfect for a serene touch of style in the bathroom. Available in White, Pearl Grey and Noisette.